A young man stares intently up Arsenal Street. It’s early morning, already sticky warm in St. Louis. His Metro travel trainer, Feld Miller, is making light chatter with him, occasionally erupting into relaxed laughter while asking questions that the young man answers quietly, keeping his sight on the street. “What time is the bus coming?” Miller asks. “That’s right,” Miller replies encouragingly. The young man pulls his reduced fare Metro pass out of the blue sleeve hanging around his neck. He studies it briefly, then his gaze fixes again toward the west. His bus is coming. 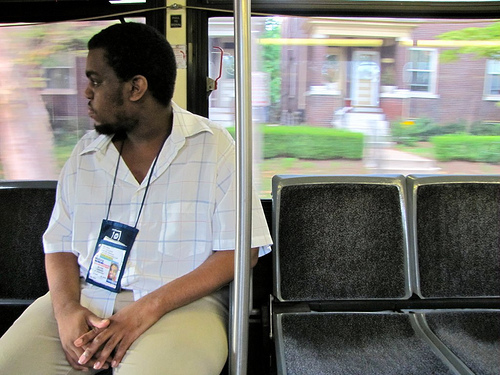 Taking public transit can be daunting for many people, but for individuals with cognitive or physical disabilities, navigating the transit system can pose a seemingly endless series of obstacles. Which bus do you catch? At which stop? Can you get to your stop over aging sidewalks? 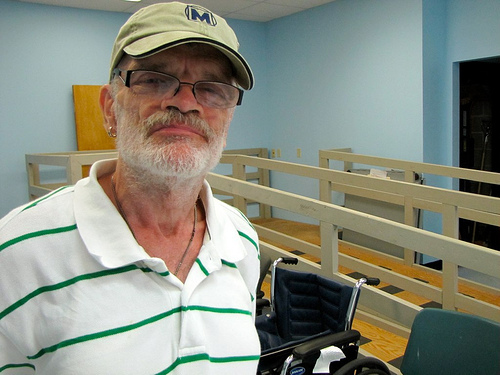 Many people with disabilities and seniors may qualify for Metro Call-A-Ride paratransit service, but would like to save money or practice more independence. 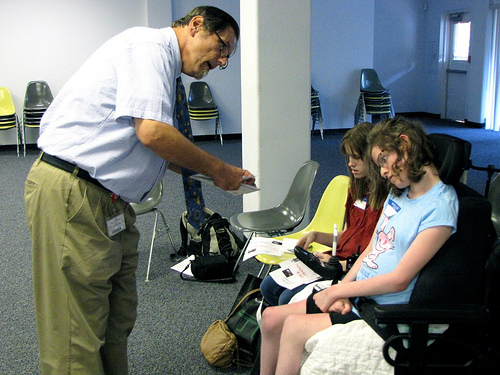 To help more people use the transit system, Metro’s ADA Services initiated the Travel Training Program in July 2006 by bringing on Mike McDermott, who has more than 20 years in the special-education field. Since then, the program has added five travel trainers and graduated nearly 1,000 people. The walls of the small office in the Transit Access Center are covered in letters, pictures and words of thanks from graduates and their families and advocates. John McKenney retired as a MetroBus operator three years ago after he lost some of his peripheral vision, but wanted to stay with the Agency; he found his way to the Travel Training Program. On the wall next to his computer is a picture of a happy young man, grinning at the camera. “That’s my special buddy,” John fondly explains. The young man calls John frequently, just to talk. Recently, the young man’s mother called to report that his father had passed away. John attended the memorial services to be there for his friend. The Travel Training Program is free to anyone who qualifies for a Metro Reduced Fare Transit Permit, both in Missouri and St. Clair County, Illinois. To get started, a person (or their family or case worker) sets up an assessment. The assessment helps the Travel Trainers determine if the person is physically or cognitively able to try independent transit travel. Then the trainee determines his or her destinations – school, work, job training, medical appointment, family, etc. Once a location or multiple locations are identified, the travel trainer will map out a transit trip and create a color-coded schedule that contains all of the necessary information. If a trainee has a low level of literacy or cannot read, the travel trainer will create a pictoral or “sight word” schedule. The schedule is then laminated and placed in a blue pocket holder with the trainee’s reduced fare card, pass, additional schedules, and other items necessary for transit travel. Sometimes, the pocket might include note cards to help explain the individual’s travel needs to drivers. The program focuses heavily on community safety skills including safe street-crossing, dealing with strangers, stating bus numbers, transfer and destination points, and what to do if you miss your stop, etc. The young man looks to Miller, then reaches up and pulls the cord. “Ding!” the stop bell rings out. 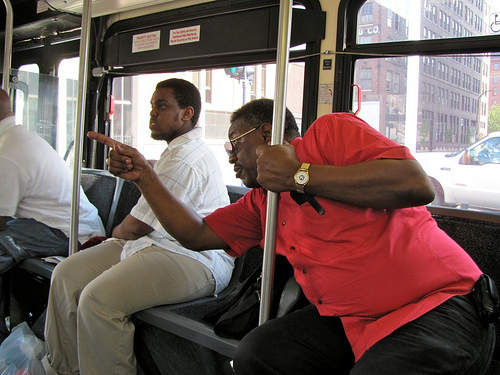 He and Miller get off the bus a couple of blocks from his destination, a job-training course in downtown St. Louis. Along the walk, Miller keeps an eye out for hazardous conditions on the sidewalk, points out landmarks, and monitors the young man’s understanding of and comfort with the commute. The young man is quiet, but moves confidently towards his destination. Miller feels good about his training. Once they reach the center, Miller escorts him to his job counselor and shows him to the classroom where he’ll receive training. He makes sure the young man takes a seat at a long table with other students, and then offers more reassurance: “All right, man, you’ll do well. I’ll be right here when you get done, and you can take us home.” The young man waves goodbye, then focuses on the front of the classroom. For more information on Metro’s Travel Training program or to schedule an assessment for yourself or someone you know, please contact Metro’s ADA Services at (314) 982-1510 or TTY (314) 982-1509. With the ADA training program at Metro, the men and women at Gillig and at Siemens Transportation are hard at work building the rolling stock for us. Also we give thanks to the talented employees at Cummins for the hard work they do in building the muscle machines that live inside the engine compartment of our MetroBuses. When it comes to Metro and the ADA, Gillig ROCKS!! !